A brief history of Cotswold Motoring Museum. 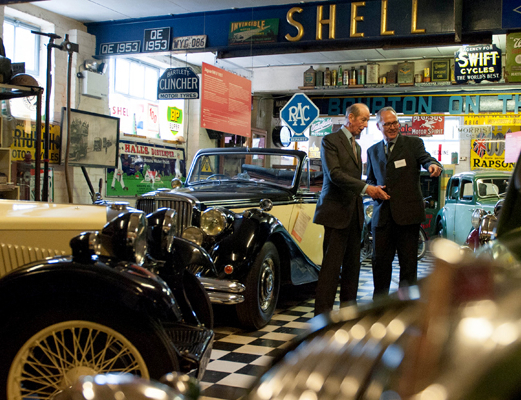 Cotswold Motoring Museum first opened in Bourton-on-the-Water in 1978. It was founded by Mike Cavanagh, a private collector who amassed a substantial collection over a period of 20 years while he was living in South Africa, starting with a 1929 Brooklands Riley he bought for £30 in 1959. His first enamel sign, advertising Pegasus Motor Spirit, he found tied to a gate in the Eastern Cape – it now accompanies more than 800 signs on display at the museum. When he returned to England in 1978, he shipped his entire collection over with him and was lucky enough to find the Old Mill in Bourton-on-the-Water disused and up for sale. The mill building and its location made an ideal home for the collection and so the museum was born. When Mike Cavanagh retired in 1999, he sold the museum to CSMA Club, now known as Boundless. Since then the museum has continued to develop. The grade-two listed building which houses the museum dates back to the 18th century and was once a mill with a water-wheel driven by the passing River Windrush. The mill was later powered by steam, and then diesel, before ceasing operations altogether in 1949. The building was then used as a store and retail outlet for a farmers’ cooperative before closing down completely in the early 1970s. It lay empty for a number of years before becoming Cotswold Motoring Museum. Mike’s collection remains the core of the museum today and, as such, the museum largely reflects the personal interests and preferences of this unique enthusiast. CSMA was launched in 1923 by a group of founding members with a shared passion for motoring and adventure. Staying true to this pioneering spirit, 2016 saw the launch of Boundless, with the aim of helping members to make the most of their free time by providing access to exclusive deals, perks and inspiration on everything from days out to holidays. Boundless have been closely involved with the development of the museum over the years, and continue to be so. They’ve helped improve the standard of the museum in various ways, including care of the collections, access and developing the museum’s educational role. We’re happy to say the museum is still growing. Since 1999, Boundless has continued to acquire cars, motorbikes and bicycles, as well as adding to the memorabilia collection. And, in 2005/6, the Club built a new gallery which allowed the collection to expand further to cover motoring during the 1960s and 1970s. 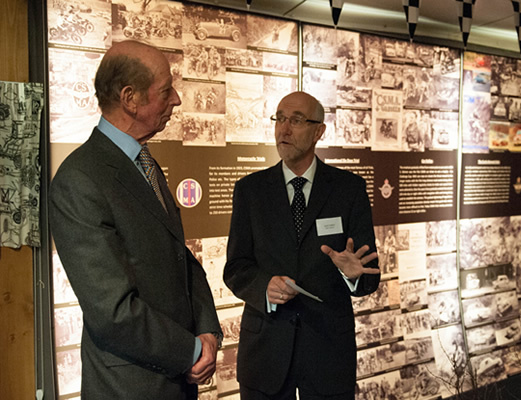 HRH The Duke of Kent, patron of CSMA Club, visited the museum to open the ‘Mud, Track and Tarmac’ exhibition to celebrate the Club’s 90th anniversary. 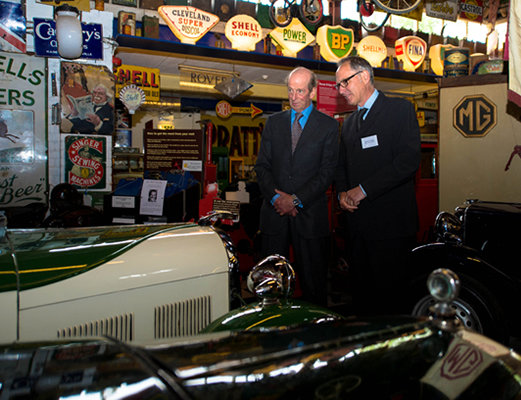 Escorted by museum manager Michael Tambini, the Duke toured the museum’s extensive collection of motoring artefacts and took a particular interest in the Jaguar XK140 and the Austin 7 Swallow, two of the most beautiful cars in the collection. 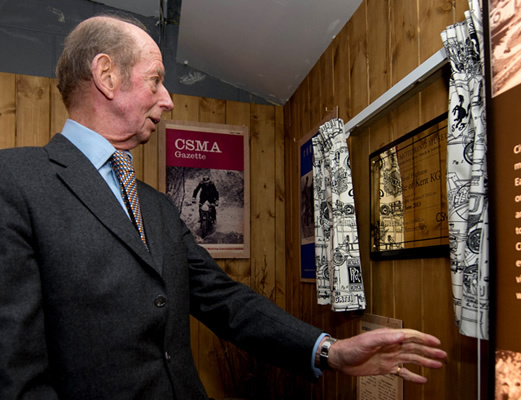 In welcoming the Duke to the Museum, CSMA Club Chairman Dave Farris said: ‘In 1923, Frank Vernon Edwards wanted to share his passion for motoring with his colleagues and as a result our Association was formed. After meeting some of the museum’s army of volunteers, many of whom visit every week, the Duke was presented with a commemorative Winged Wheel by volunteer Arthur Bartlett, who was born in the mill buildings adjoining the museum 82 years ago. He also unveiled a plaque commemorating his visit and the Club’s 90th anniversary.